Hey, did you all see my post about Pi Day next week? You know, the math nerd holiday? March 14 or 3.14? Yeah, I’m that Class A math nerd. I’m having a Pi Day Pie Party to celebrate! There will be a pie link-up and some fun giveaways. 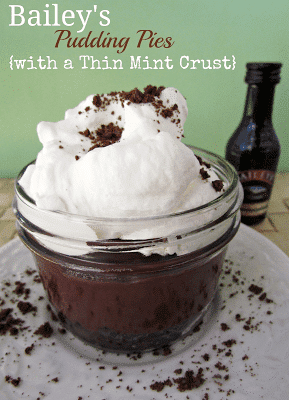 In honor of Pi Day next week, I have a few pie recipes to share with you in the coming days. 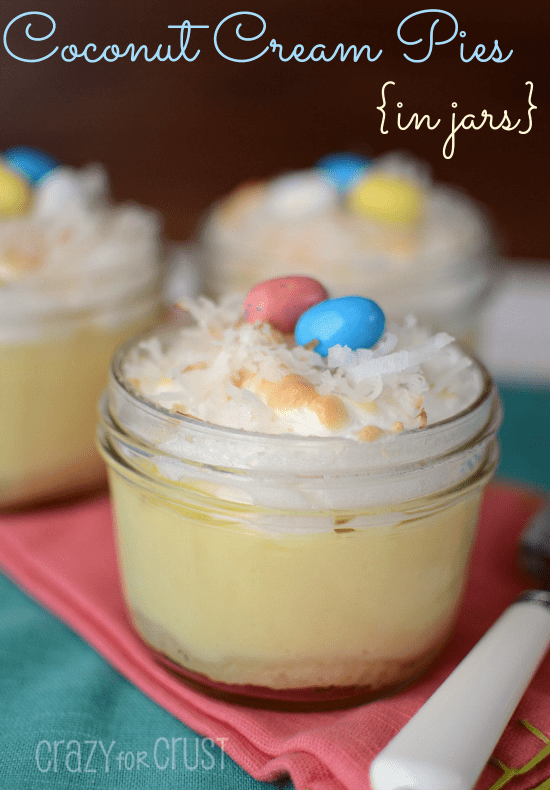 First up, these cute-as-ever Coconut Cream Pies in Jars, all nested out for Easter! I am slightly obsessed with jars. They are super fun to make desserts in. I made pink velvet cupcakes in jars. And Bailey’s Pudding Pies in jars. 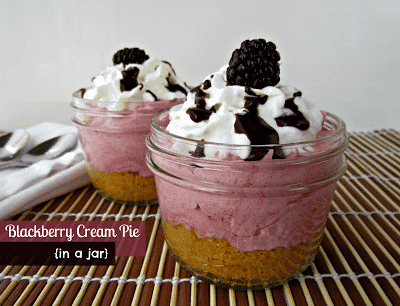 And now: coconut cream pies in jars. 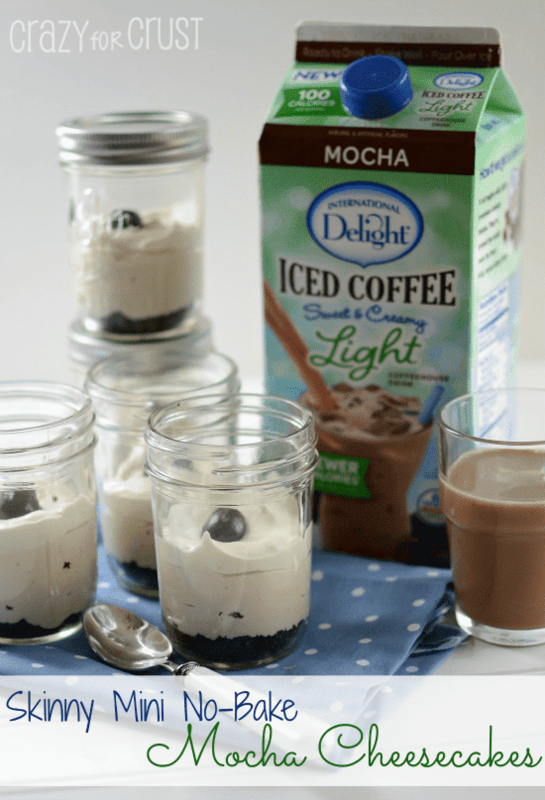 This recipe comes from Desserts in Jars, the cutest-ever cookbook by Shaina Olmanson. Have you read that book? It’s like a work of art, really. She’s got pies, cakes, ice cream, breakfast, you name it, all in jars! I cannot wait to eat my way through this cookbook. It took me days to figure out what to make and share with you. I just Could. Not. Decide. But once I thought about it being almost Easter (??!!) these coconut cream pies spoke to me. 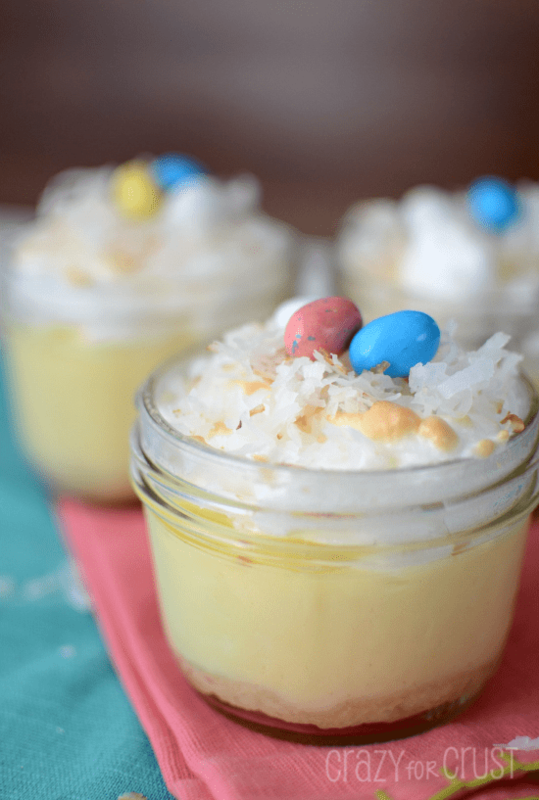 Coconut goes hand-in-hand with Easter and I knew I could dress them up a little by adding some toasted coconut and mini candy eggs to the top. 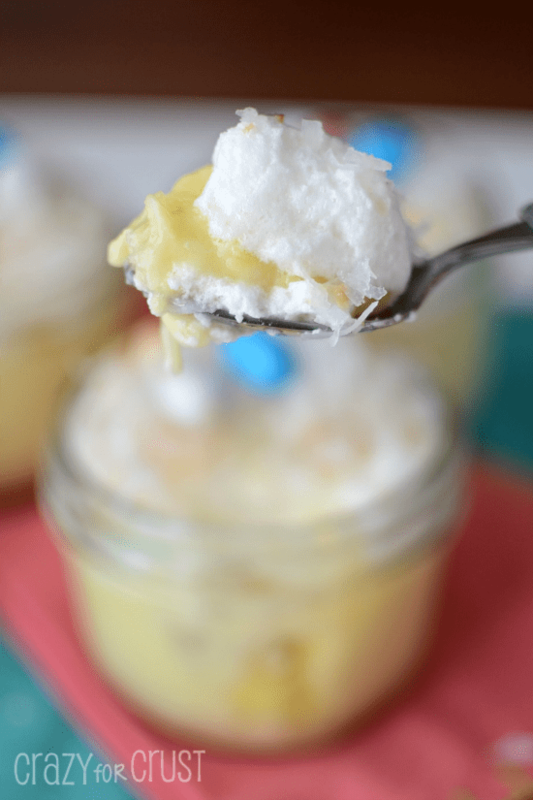 A Coconut Cream Pie Nest in a Jar! Oh, and did I mention the heavenly fluffy meringue that’s on top of the coconut cream? Ohmigodsogood. I’ve never made meringue before and now…now I don’t want to stop. Along with my copy of Desserts in Jars, I also received the new cookbook by Dede Wilson, Cake Balls to drool over. Cake Balls includes more than 60 recipes for all kinds of from-scratch cake balls. She even includes all the cake and frosting recipes you’ll need too! She’s got recipes like Creme Brûlée Cake Balls, Coffee Crumb Cake Balls, and Peanut Butter Cake Balls. Guess what? 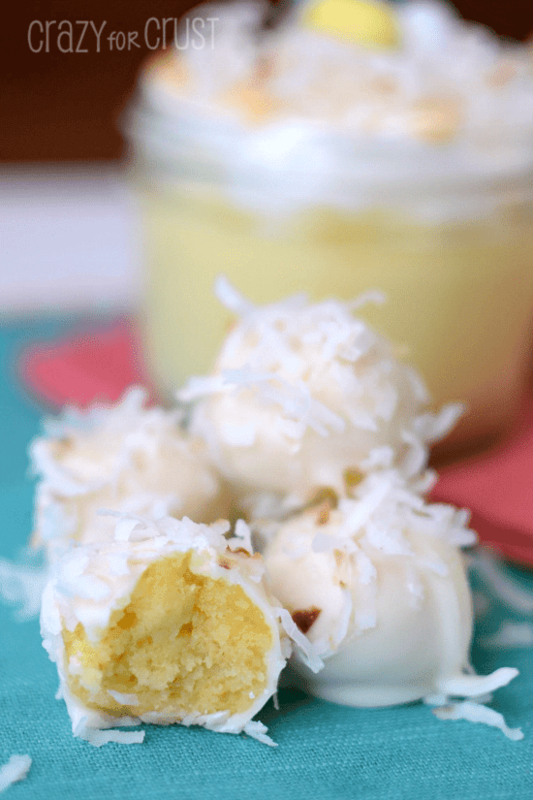 There’s also a recipe in there for Coconut Cream Cake Balls. Instead of mixing the crumbled cake with frosting, you mix it with coconut pudding. Are you guessing where I’m going next? Instead of making 8 coconut cream pies, I saved some of the coconut pudding and made some cake balls with it. Guess what? Dede Wilson is absolutely a genius! You can totally make cake balls with pudding instead of frosting. Mixed with the white chocolate coating, they are the perfect amount of sweetness. Seriously you guys, I have so many recipes on my list to make now. Apple Pie Cake Balls. Nutella Cake Balls. Neapolitan Cakes in jars. Pans au chocolate IN JARS. Seriously, these cookbooks are going to make me need new pants. Because don’t you just want a bite of that goodness? You know you want these cookbooks, right? You’re salivating and want them NOW. Well, guess what? I’m giving both cookbooks away to one lucky Crazy for Crust reader! Scroll down to enter! To make the crust: pulse flour, salt, and sugar in a food processor. Add the butter and pulse until pea-sized pieces of dough form. Start with 4 tablespoons of water and pulse just a few times. The dough will still be crumbly, but will stick together when pressed. Add more water if needed. Note: it will not form into a ball in the food processor! Remove from machine and turn into a bowl. Press together to form a ball. Wrap in plastic and chill for at least one hour. When dough is chilled, remove from refrigerator and roll until 1/8-1/4” thick. (I like my dough thicker!) Use the open mouth of the jars to cut circles of dough. Press one circle of dough in the bottom of each jar. Bake 2” apart on a cookie sheet at 350 degrees for 10-12 minutes. Cool. In a large heatproof bowl, whisk the egg yolks and 2/3 cup sugar. Whisk until the mixture is pale yellow and smooth, 30-45 seconds by hand. Add the milk and cornstarch to a medium sized saucepan. Set it over medium heat until bubbles begin to form around the edges, stirring constantly, about 5 minutes. When the milk is hot, pour about 1/2 cup into the bowl of egg yolks, while whisking to temper the eggs. Whisk in about another 1/2 cup of the hot milk into the eggs, then pour the egg mixture back into the rest of them milk in the pan. Continue heating until it thickens and coats the back of a wooden spoon, just a minute or two. Remove from heat and add vanilla extract, coconut extract if desired, and coconut. Spoon the pudding evenly over the cooled crusts in the jars. Chill until set, about 3-4 hours. Preheat oven to 400 degrees. Remove the jars from the refrigerator and set 2” apart on a cookie sheet. Beat egg whites in a medium-sized bowl with a hand mixer until foamy. Add the remaining 1/3 cup sugar and continue beating until stiff peaks form, to create a meringue. Spoon evenly on top of the pudding in the jars. Bake 4-5 minutes, until the meringue is golden brown. Cool, then top with additional shredded coconut and/or mini candy eggs for decoration (optional). Fine print: I was given both cookbooks for review. This review was not compensated. All opinions are 100% my own. Giveaway open to U.S. residents only. Winner will be contacted via email when the contest closes and will have 48 hours to respond, or a new winner will be chosen. Crazy for Crust is not liable for shipping or providing prize. I’ve made so many pies as gifts, usually chocolate meringue or toasted coconut meringue, but my new favorite is tart lemon meringue! Would definitely use these books! So adorable! Perfect for Easter! I was searching for Easter ideals and ran across your blog!!! Love what I am seeing. These recipes sound yummy! Thanks for sharing and for hosting the giveaway!! !